With tornado and storm season here, residents of Oklahoma realize the potential for tragedy in their communities. Recent tornadoes in Quapaw, killed one person and caused severe property damage. If your home or business has been damaged by a tornado, hail storms or other severe weather conditions, your homeowners’ or business property insurance should pay for repairs or rebuilding. We may be able to help. Call us now at 1-877-392-4878. My claim is being low-balled. Is your insurance company not recognizing the value of your property that was destroyed or damaged? Is it putting a dollar value of well below what it should be? We can typically negotiate better because we have worked with this type of situation. My insurance company is dragging its feet. Yes, it takes a while for paperwork to be processed, but when you have a feeling something isn’t right, it’s time to get help. My claim is being denied for a reason that seems unlikely. Sometimes claims actually can be denied, but you have a right to know why. If the reason for the denial seems unlikely, you need to talk us so we who can investigate and provide direction to you. My insurance company says the damage to my house wasn’t caused by the tornado. Sometime the excuses to not pay you what you are owed might seem ridiculous. If this is the case, contact Carr & Carr to see what options you have. Having us work for you to get the best offer will be easier on your family while you are trying to put your life back together. 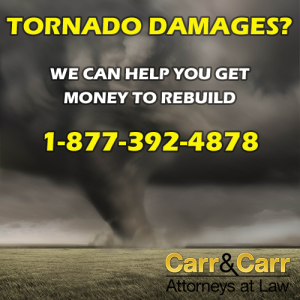 During this stressful period, our law firm, which has helped tornado damage victims, will be able to work on your behalf to get the best possible outcome for your family. It won’t cost you anything to see if we can help. There is no fee for our legal services unless we are able to help you. No money comes out of your pocket upfront. We can deal with your insurance company and take away your frustration. And if your insurance company refuses to do the right thing, we will pursue legal action to get you the money you deserve.